Records updated to 2014 now stand at 582 species, closing in on 600!! 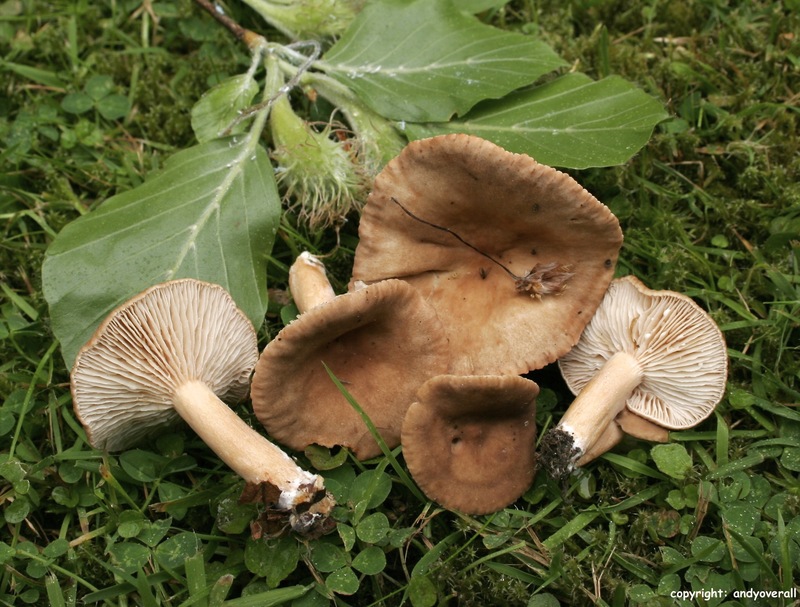 Standout species…Cortinarius nolaneiformis as new to Britain, Amanita simulans, Russula atroglauca and Russula vinnosobrunea all new to Middlesex and the Heath, are also very rare records for the country. Click on the link below to view the database. 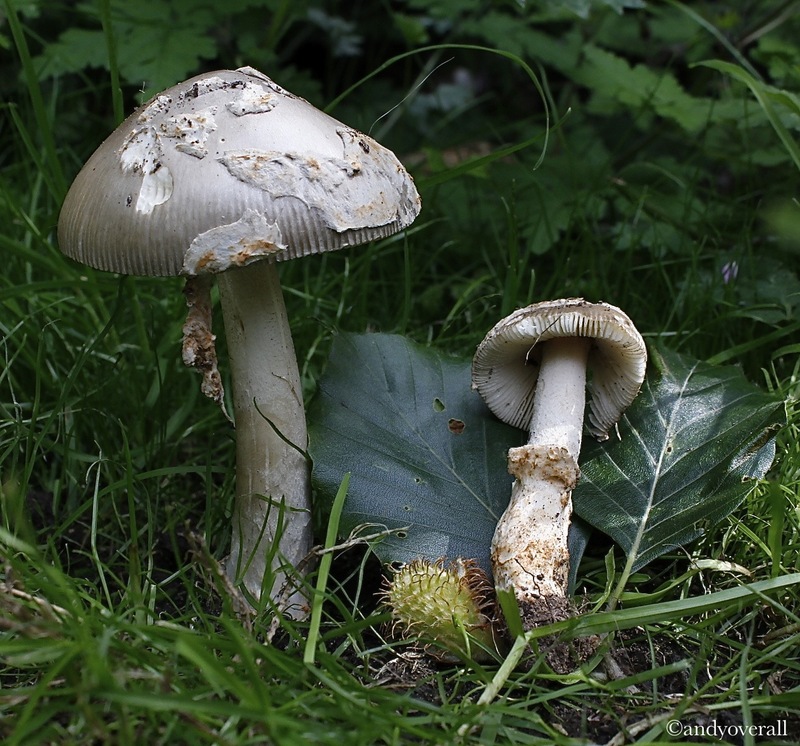 Amanita simulans-new to Middlesex-Hampstead Heath – 17/06/2014-On acidic/neutral soil with Fagus. One of the ‘Grisettes’ belonging to section Vaginatae of the genus Amanita. Described as a new to science in 1999 by contu, then reported from this country in 2008. There were only four records for this species so far in the UK, making this the fifth. Post by Fungi To Be With. 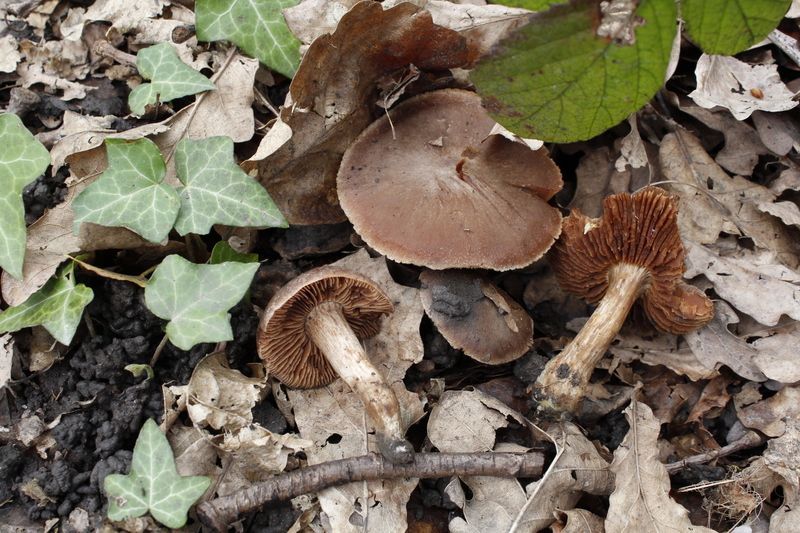 On April 9th 2014 I came across an interesting Cortinarius on the west bank of the mixed pond on Hampstead Heath. I was there continuing a survey (carried over from 2013) for CoL around the Hampstead and Highgate pond chains. The Cortinarius, following much research, communication and help from fellow Field Mycologists, was finally confirmed as Cortinarius nolaneiformis, a species new to Britain. During the research into identifying this species I made contact with French mycologist Jacques Melot, little did I know that it was he who published the neotype for a species called Cortinarius irregularis having previously published C. paruraceus now synonymous with C. irregularis. Jacques recognised my collection as C. irregularis pretty much straight away. 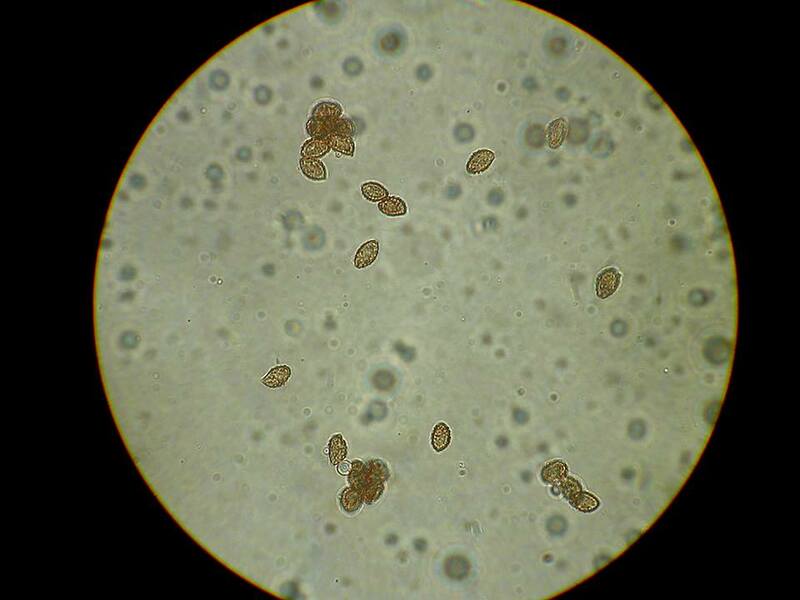 The spore range is surprisingly broad, the spores shown below represent the lowest range. However, due to the lack of forthcoming material for the type of C. irregularis this species is currently regarded as a Nomen Dubium. As a result, C. nolaneiformis has been combined as a new species by Finnish Mycologist, Balint Dima with whom I communicated regarding my collection. Cortinarius nolaneiformis is regarded a precocious species, meaning that it occurs early in the year from April onward. It is a taxa belonging to the subgenera Telemonia and to the section colymbadini. Some believe it belongs to section uracei as the fruit bodies darken upon drying. There are number of sections that exhibit similar characteristics. The fact that C. nolaneiformis does not blacken as such, reveals that it falls within colymbadini. Another characteristic is that gill and cap tissue squashed in 2% KOH with water and left to dry will leave a yellowish/green dye at the edge of the cover slip. Other close species would be C. rigidipes & C. colymbandinus however these species would be fruiting later in the year. However, the story did not end here. Following further research a critical article came to light on the existing known species within the sections Colymbandini & Uracei, plus two newly proposed taxon and one new combination. This article produced a tree of the DNA sequenced species along with other sections, Cinnabarini, Brunnei & Hinnulei. Scanning the table I could not see C. irregularis among the species, rubbing my head I took a look at the newly proposed species and was almost certain that it was one of these. I then emailed the main author this paper, Balint Dima, based in Finland, to ask why C. irregularis was not included therein. His reply was very interesting, he had requested material from Jacques Melot which was not forthcoming, Balint then excluded the species from his study, a name which he considers to be a Nomen Dubium. On the information that I provided Balint, he strongly felt that what I actually had was C. nolaneiformis a species known to be a widespread spring species in Europe with both Conifer and Oak. 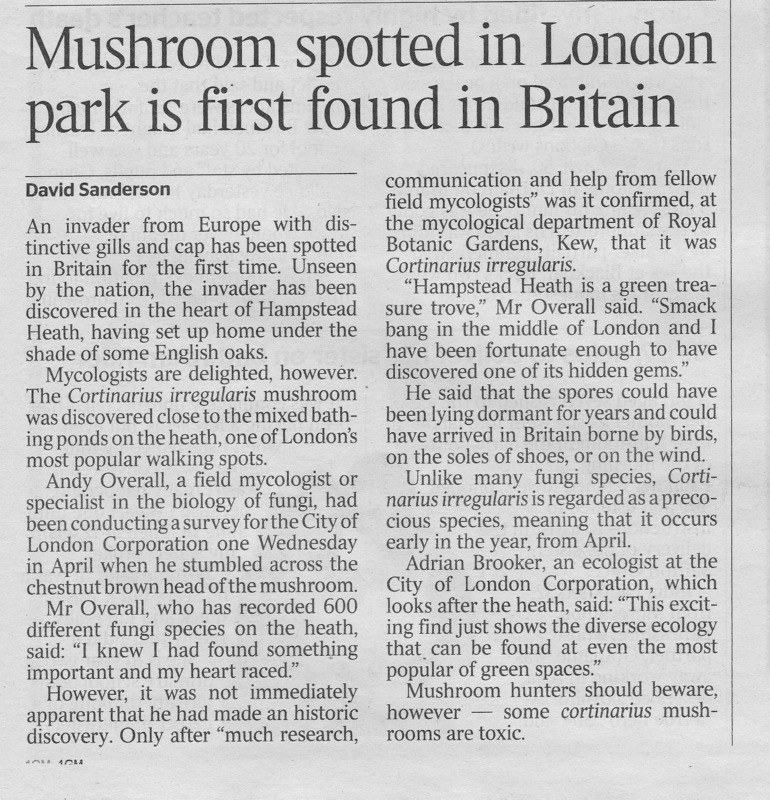 This was borne out when the material was DNA sequenced at Kew, a 100% match with Cortinarius nolaneiformis. A vernal species that is still New to Britain despite the difficulty in getting there. PHEW!!! Cortinarius nolaneiformis will be published as New to Britain in the forthcoming publication of Field Mycology – Autumn 2014. A pond margin consisting mainly of Quercus rober surrounded by a few young specimens of Fagus silvatica, Carpinus betulinus the odd Cratageus and Salix amongst Acer and some Rhododendron, on London Clay. Most likely associating with Quercus. Which is interesting as on mainland Europe it mainly associates with Picea, Spruce. Cap 30-70mm convex, low conic, flat, mid to chestnut brown, with cream margin from velar remnants, surface on some appearing as if dusty from velar remnants, some more silky looking, margin striate at immature stage, lost in maturity, hygrophanous, drying in pale brown streaks against red-brown ground. Stem 38-53 x 7-12mm (base up to 12mm in some) cylindrical, base swollen or somewhat tapered, longitudinally fibrillose, streaked white & brown, base paler but not distinctly so. Flesh a washed out pinkish brown. 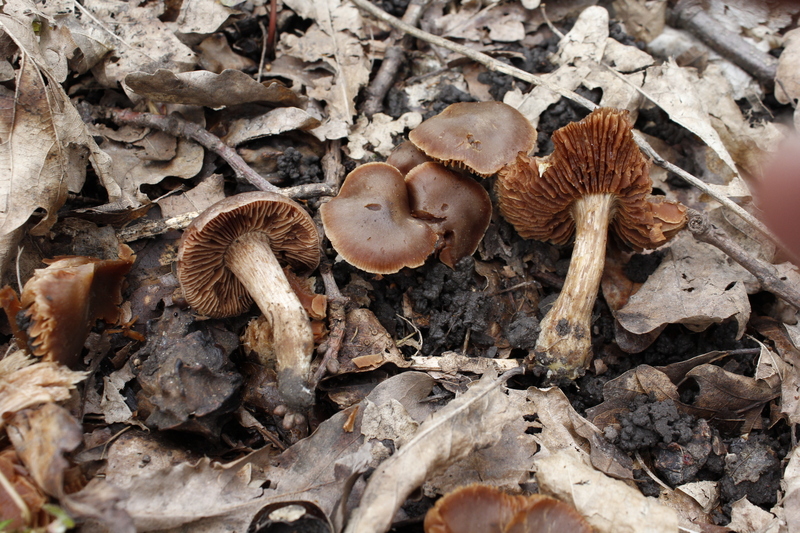 Gills adnate with decurrent tooth, cinnamon brown with pale edge when immature, pale edge lost in maturity becoming a rich red brown, fairly crowded, differing lengths, edge entire. Qmin = 1.55, Qavg = 1.70, Qmax = 1.83. Cheilocystidia – In Clusters, short clavate, abundant. 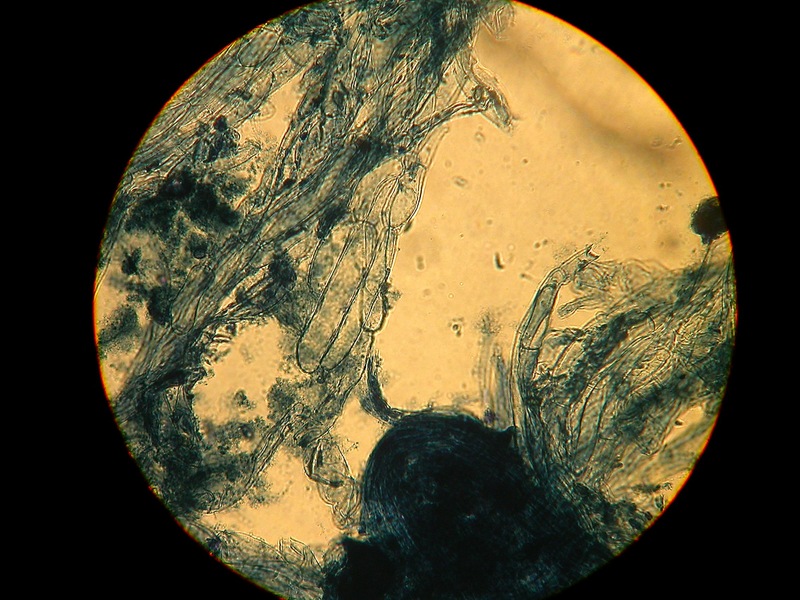 Pileipellis and gill trama hyphae (clamped) – Sausage shaped and smooth. Cap and gill tissue squashed in KOH 2% with water, leaves a green/yellow pigment on the edge of the cover slip, as it dries. Photo © Andy Overall Heavily verrucose spores in Meltzers Reagent. Photo © Andy Overall PP cells, smooth. I’ve included this picture of the cap cuticle cells to highlight an important difference between this species and Cortinarius vernus, the cells above are smooth as opposed to the cells of Cortinarius vernus which are encrusted. Press on the link below to view the final published article on this species in Field Mycology. Psathyrella Key 2012, photos, illustrations, descriptions. Interested in Psathyrella? Well here is a page dedicated to the genus which includes photographs and drawings with original and modern descriptions, a rarity indeed, and a modern key to the genus all put together by Andreas Meltzer in 2012.
that has received official approval from JNCC. Please find below, a link to the document. 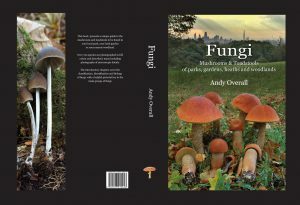 You are probably aware that in the latest National Curriculum document for England there is no mention at all of fungi, whilst plants and animals are each mentioned over sixty times. Over the last couple of days the BMS Fungal Education and Outreach Committee (FEO) have drafted suggested amendments to the document that would facilitate the inclusion of fungi in the Primary School Curriculum. This has now been sent along with a letter from the President, both by email and by post to the Department of Education. We would now like to ask the BMS membership to help address this important omission. The FEO have drafted a response that individuals may use if they wish or they may wish to write their own message of support. Please find this attached. Responding to the document is very straight forward. You may unsubscribe from this mailing list at any time. The genus Lactarius can be difficult to ID to species as many look very similar, as a result microscopic work is often needed to confirm which species you actually have and this species is no exception. All species of Lactarius release a liquid substance which is referred to as lactating, this substance can be watery, white through to blood red, some of the ‘white milk’ species turn yellow when it combines with oxygen. The different colours of liquid can also help with identification, this species has a white, unchanging liquid. 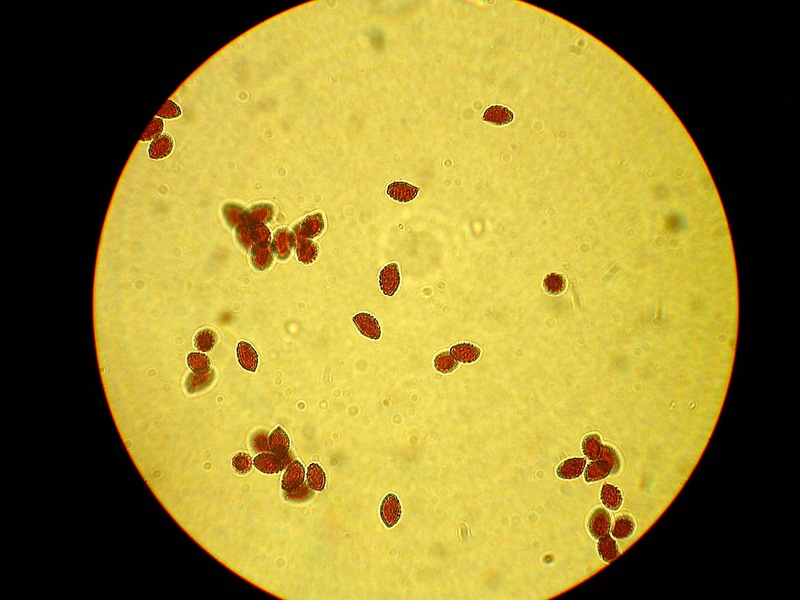 The fact that L. subdulcis often associates with Beech trees and has dull flesh-brown colours does also help with ID but so can other, similar looking species such as, L. decipiens (white milk changing yellow) and L. tabidus (white unchanging milk), therefore, in this case, the microscopic details, especially of the spores and of the cells of the cap cuticle are of importance.